JOHN BEARD. We have not yet found John’s baptism. His marriage in 1743 suggests a birth date around 1715-20. There is a possible baptism for a child of his in St Sidwell’s, where he was married, and then four others, certainly his and Catherine’s in the neighbouring parish of St David. This may be where John grew up, but we have no definite information. Nor do we know his occupation. On 2 Dec 1742, a year before John’s marriage to Catherine, there was a baptism at St Sidwell’s of John, son of John Beard. There is as yet no evidence to show whether this father was the same John, with an earlier wife, or another. A John Beard had married Jane Davy in St Sidwell’s in 1730. There were other men of the same name in and around Exeter. In 1746, John Beard, Soldier, married Urith Brooks in St Davids. This one is clearly not the same man. The large parish of St Sidwell lay on higher ground to the north of central Exeter, with St David to the west. Both were outside the city walls. CATHERINE FLOOD was the daughter of Willem Flod. She was baptised at St Sidwell’s Church on 26 Sep 1714. Exeter was a small city with 17 parishes. It was easy for people to move around and use different churches. There are several baptisms for children of William Flood. We do not know whether all of these were the same man. It is possible that Catherine had a sister baptised at St Mary Steps, on the other side of Exeter, in 1700. 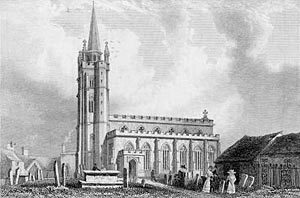 There were probably two sisters baptised at neighbouring St David’s in 1709 and 1711. We can feel fairly sure that she had a younger sister baptised at St Sidwell in 1719. Catherine was thus the middle child in a family of girls. We do not know her mother’s name. On 29 Nov 1743, John Beard married Catherine Flood at St Sidwell’s. The first possible child is Elizabeth, daughter of John Beard, who was baptised at St Sidwells on 30 Jan 1747. The absence of the mother’s name leaves it unclear whether her parents were John and Catherine or another John Beard and his wife, perhaps the same John Beard who had fathered baby John in 1742. The next certain reference to the couple is in the neighbouring parish of St David’s, where they had four daughters baptised. The St David’s register gives the mother’s name. 1749 Mary Daughter of John & Catharine Beard. February 9th. 1753 Hannah Daughter of John & Catharine Beard. July 18. 1758 Dinah; Daughter of John & Catharine Beard. March 27. Their daughter Jane was still living in St David’s when she married Richard Gay in 1787. We do not know when John and Catherine died.